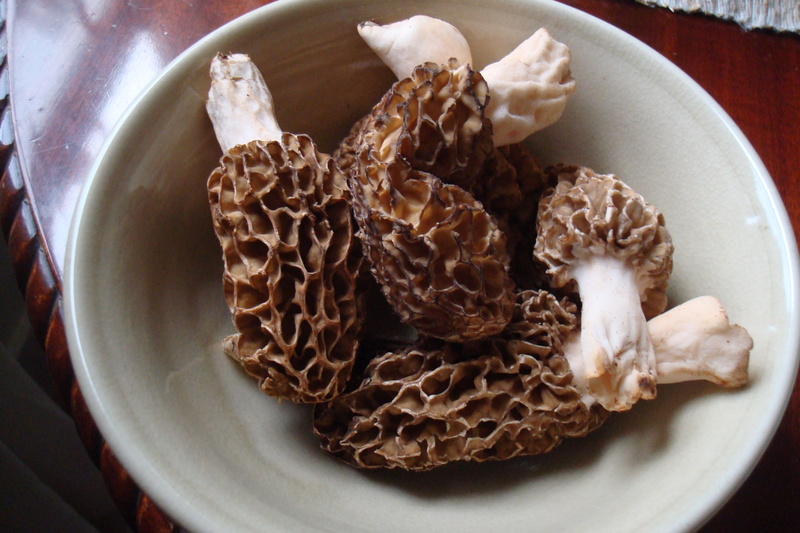 Creamy, lemony goodness, with some sauteed earthy rings of morels. Some random seasonal ingredients I sprang for through Corvallis Local Foods came together in my souped up version of the Greek avgolemono (Lemon and Egg) soup Monday night. I fell in love with this simple soup while waiting tables the summer after my sophomore year of college at the now defunct Konsta’s Restaurant in Richmond. That soup was the one thing we were allowed to eat on the house. Purchasing some tart sorrel leaves inspired my recipe. I had never heard of this cool weather spring green until chancing upon it at the market last year. Related to astringent rhubarb, sorrel is high in potassium and Vitamin C, but also oxalic acid, so it should be eaten in moderation, especially if you’re prone to kidney stones. I also just put one scrappy sorrel plant in my garden and look forward to harvesting the perennial next spring. Chefs seem to use it in salads, sauces and pestos and soups. It seems my impulse to pair lemony sorrel with creamy eggs was right. Then I had homemade chicken stock in the fridge, after roasting a whole bird. Plus farm fresh eggs and plenty of lemons. So avgolemono, or to be exact, an adaptation of Mollie Katzen’s Moosewood “Mediterranean Lemon Soup” it would be. In a separate pan, I caramelized onions and then sauteed some cross-section circles of the morels I finally got my hands on from the Mushroomery and added that to the finished soup. I had plenty of mint and other herbs in the garden for garnish. Instead of rice, I added my favorite “Harvest Grains” blend of Israeli couscous, quinoa, orzo and split baby garbanzo beans to the mix. 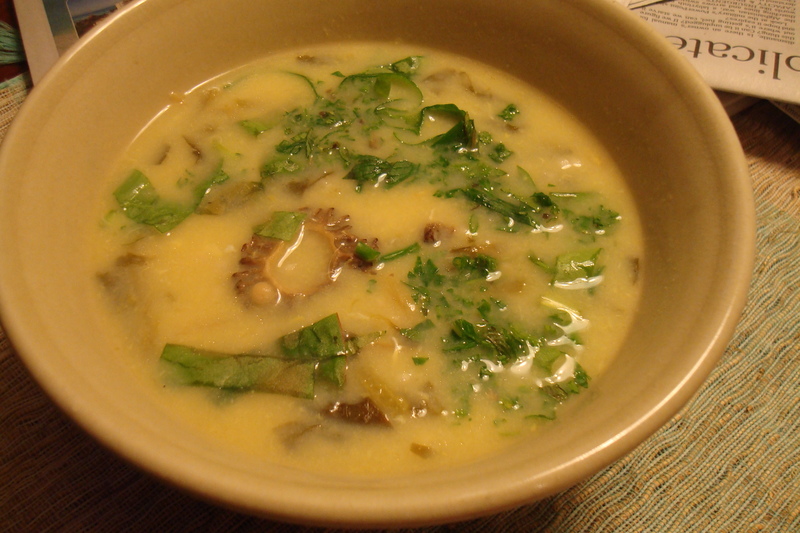 The resulting soup was creamy and light but still heartier than such lemon-egg soups usually are. We had stuffed artichokes to round out the meal. More on artichokes TK in another post.